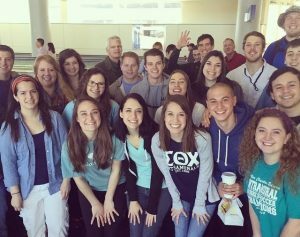 ACU students prepare to board a plane for a medical missions trip to Guatemala. 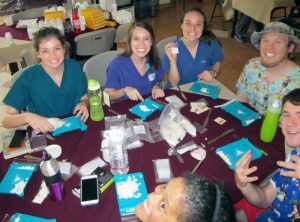 Many ACU students get their first taste of medical missions as undergraduates studying to become future doctors, dentists, nurses, occupational therapists and other healthcare professionals. 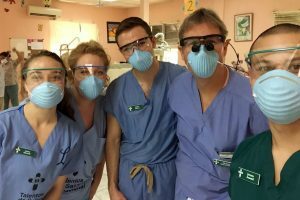 Two of those students – Jeremy Aymard, senior biology major from San Francisco, Calif., and Selvin Villeda, senior biology major from Rockwall, Texas – shared photos from their Spring Break trip last March to Guatemala, conducted by Health Talents International. HTI is a non-profit Christian organization that works within the Churches of Christ to promote medical evangelism in developing countries. Its mission is “to proclaim the gospel of Jesus Christ through teaching and healing ministries.” Drs. Cynthia (Barton ’81) and Greg Powell (’80), both professors in the Department of Chemistry and Biochemistry, accompanied the ACU group. (From left) Laura Edwards, Elena Taylor, Colton McCoy, Michael McCoy and Jeremy Aymard work in HTI’s dental clinic. Selvin said the trip “was a life-changing experience that assured me that medical missions is a path I want to take. (Clockwise from left) Jill Baker, Evan Bridges, Laura Edwards, Houston Schoonmaker, Tanner Gregory and Taylor Binkley sort medication. Aymard said the trip was life-changing for him, as well. “The short time we spent in Guatemala will impact how we practice medicine, or dentistry, for the rest of our lives – even here in the states,” he said. Aymard and Selvin are just two of the many Wildcats each year who serve as the hands and feet of Jesus throughout the world. If you have #ACUmissions stories or photos to share, post them online with the hashtag, or email Robin Saylor, robin.saylor@acu.edu.